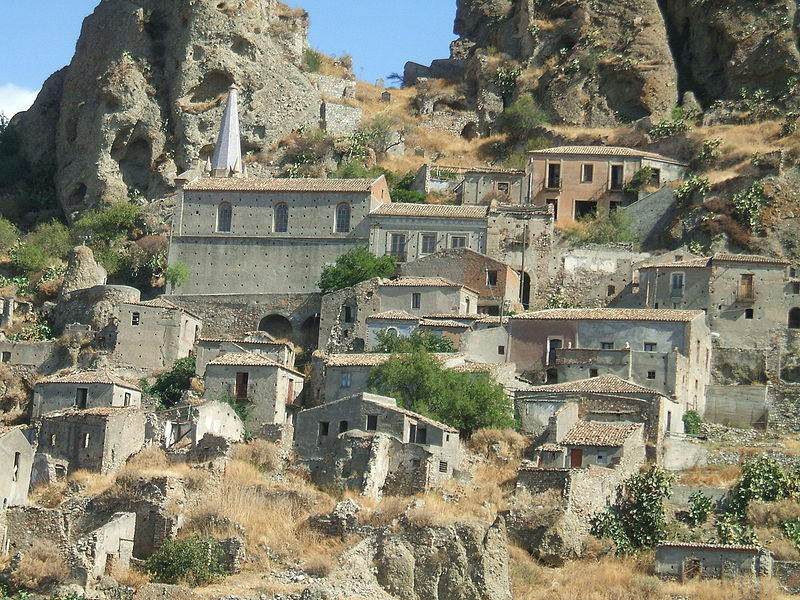 Located in the southern Italian region of Calabria, Pentedattilo is a ghost town with a very interesting history. Its name, which means “five fingers”, refers to a mountain located around the town. 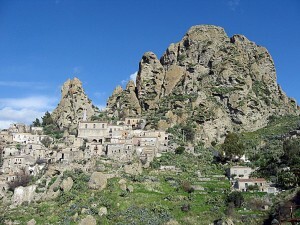 Before an earthquake disfigured it in 1783, the mountain had five rock towers that resembled a human hand with fingers. Local legend held that the mountain, nicknamed the Devil’s Hand, would one day collapse and fall on mankind. This curse was said to have been cast by Lorenzo Alberti, one of the victims of an infamous historical incident known as The Massacre of the Albertis. In 1686, Baron Bernardino Abenavoli fell in love with Antoinette Alberti, the daughter of the family that had owned the fiefdom of Pentedattilo since the late 16th century. 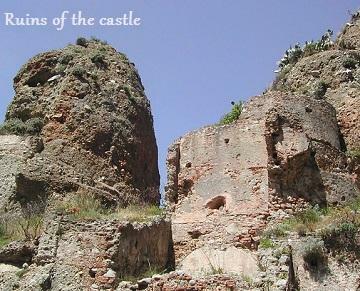 The Abenavolis, the former lords of Pentedattilo, had been in a rivalry with the Alberti family ever since. Due to this feud, Antoinette had little interest in Bernardino. When it was announced in April that Antoinette would be marrying Don Petrillo Cortez, the son of the Viceroy of Naples, Bernardino was struck with rage. On the night of April 21, Bernardino carried out a horrific plan for revenge. After bribing one of the Alberti family’s servants, Bernardino was let inside their castle with a group of his followers. Their first victim was Lorenzo, Antoinette’s brother and the head of the Albertis. As he was sleeping in his bedroom, Lorenzo was ambushed by Bernardino and then shot and stabbed to death. With the exception of Antoinette, the Alberti family and most of their guests were all massacred, including Antoinette’s 9-year-old brother Simone, who had his head bashed against a rock. Don Petrillo Cortez and his family were spared as well, but they were taken by Bernardino as hostages. On April 19, Bernardino married Antoinette. Word of the massacre spread quickly, however, and Cortez’s father sent a military expedition to capture Bernardino and his collaborators a few days later. Although 7 of Bernardino’s men were captured and beheaded, including the servant who let them into the Alberti castle, Bernardino managed to escape to Malta. He later joined the Austrian army, and died on the battlefield in 1692. Antoinette, filled with grief that she was the cause of the massacre, spent the rest of her life as a nun. Now even though Lorenzo Alberti died in his castle, the town’s folklore says that he was killed near the rock walls of the mountain. As he laid dying, Lorenzo pushed his bloody hand against the walls, leaving a permanent imprint that glowed red when the sun went down. On some nights, his screams can be heard coming from the mountain. On the anniversary of the massacre, shadows of the victims are said to appear all over the town, running from other shadows that chase them with knives. Another legend related to the massacre and the mountain’s disfigurement involves a secret treasure allegedly left behind by Bernardino Abenavoli. One night, a ghost told a knight who was passing by the mountain that the five fingers would collapse and reveal the Abenavoli treasure if somebody would run around the mountain five times. Many people tried running around the mountain, but it never collapsed. A knight from Sicily heard about the challenge and decided to give it a try. Right as he was about to finish his fifth lap, one of the fingers suddenly fell off the mountain and crushed him. Following an earthquake in 1783, a lot of the townspeople left Pentedattilo for the town of Melito Porto Salvo. Pentedattilo was completely abandoned by the 1960s, although today it hosts the site of an annual international film festival.